The Asiatic hornet vespa velutina nigrithorax is a non-native species of hornets which has invaded France and gets very bad press over here. It was first identified in 2004 in France and the story goes that it had stowed away in some pottery that had been imported from China. The sad truth is that it has arrived fromChina or South-East Asia somehow and has become acclimatised to life inFrance. Perhaps the exceptionally hot summer that France endured in 2006 helped them to get established. Each year they multiply in numbers and increase their territory. A native European hornet Vespa crabro is also present inFrance but it is a less aggressive species. The main problem is that this invasive species of hornets has destroyed large numbers of bee hives and has added to the problems of the apiculurists already struggling with falling numbers of bees. 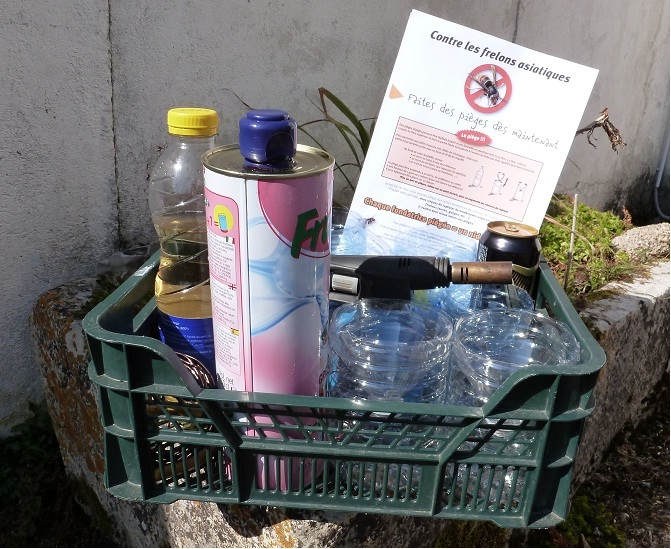 The apicultures in this area have requested the public to place traps for these invasive hornets and have sent instructions on how to make home made traps by e-mail contact between friends. 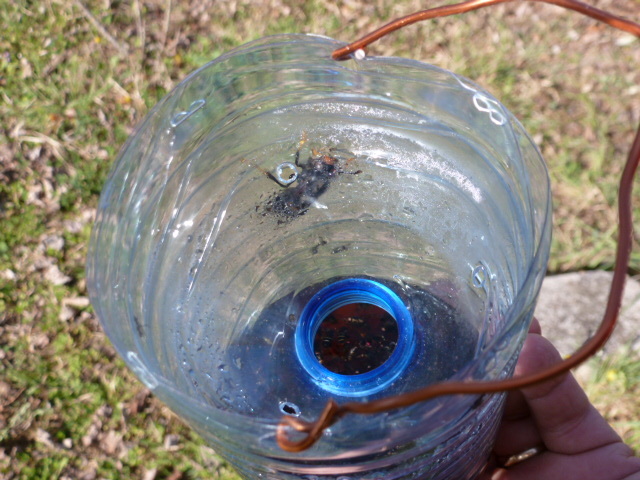 The traps are made from water bottles and lure the hornets with such temping mixtures such as beer and fruit syrup. 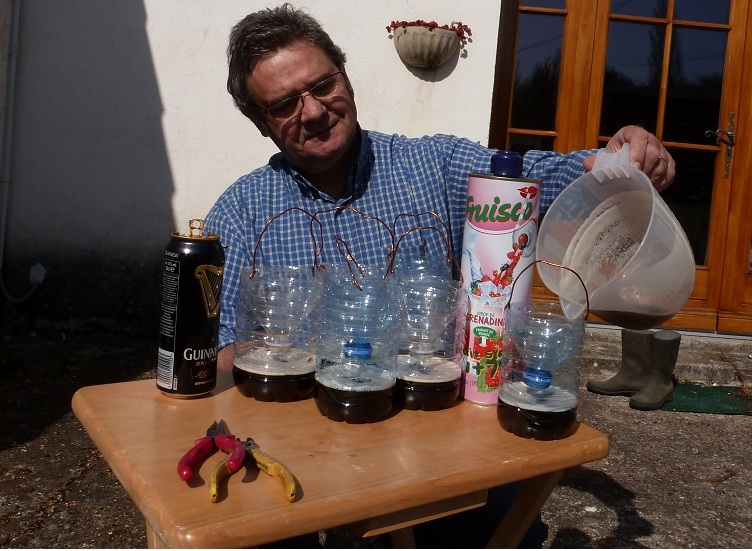 I decided to try and was aided (well he made them and I supplied the coffee) by my neighbour. The plastic bottles are also pierced with small holes in the eventuality that small insects could become trapped. Both of the hornet species feed on ripe fruit and small insects such as bees but it is the Asiatic that is extremely aggressive and can destroy whole hives. Luckily, they are of a different colouration and the Asiatic hornet, as its Latin name suggests, has a black abdomen and looks quite dark from a distance but has legs that are bright yellow at their end and the face is also yellow. The European hornet has a lighter abdomen and a more yellow thorax. The European hornets are attracted to the light and may come towards windows in the evenings but the Asiatic hornets are not attracted by light. Now (between February and May) is the best time to put out the traps for the hope is to catch the young queens before they make their nest. The young fertilised queens do not stay in the maternal nest but over winter in dead trees or inside stone walls or dry vegetation. As they come out of hibernation they will seek out a nesting place but will also be seeking food. The theory is that if the cycle can be arrested at this stage each queen destroyed would prevent a nest being built. The nest are huge and spherical, 40 cm. (16 inches) in diameter by the end of the season holding up to 5,000 hornets. I saw this video on YouTube, it’s not the Asiatic hornets but the video is brilliant. On a more scientific note and if your French is up to it, this is also an amazing video (see link below). It shows the hornets waiting to pick off the bees as they return to the hive. Any that dare to land on the hive are attacked by the guards who join in a fight to the death that may take an hour with an uncertain outcome as far as the hornet is concerned. The bees in Asia have developed a defence mechanism by forming a living ball around the aggressing hornet and by beating their wings they increase their body temperature and so increase the temperature at the inside of this infernal ball to 45˚ C weakening and killing the hornet. The bees themselves can support this temperature. Now if you are still with me maybe you can help me with my dilemma. I put up my traps a week ago but in recent days I have been becoming unsure of their efficacy. I see a lot of dead things in them. The theory that the little trapped beasties happily fly off is not holding. Then today on checking a trap: I find I have caught one. The dark body and the give away yellow legs and face allow a positive identification. I have not got her out of the trap to measure her but given that the queen is 3 cm long and the worker 2.5 cm. it is not going to be easy. Is that at full stretch or curled in her death agony? Given the start of spring here after a long cold spell it is more likely to be a young queen recently out of hibernation looking for a snack before she founds a colony. See the video of the “catch” on YouTube. Does this mean I have to build better traps? Categories: Nature, Wildlife | Tags: Asiatic hornet, bees, garden, traps | Permalink. We have masses of carpenter bees, they arrived with the first Wisteria blossoming. They love Wisteria and now they are on the Spanish Broom and Nepeta. I presume you like the Carpenter bees. I think there may be more than one type unless the first ones I saw were queens and therefore bigger than the ones that are current at the moment. 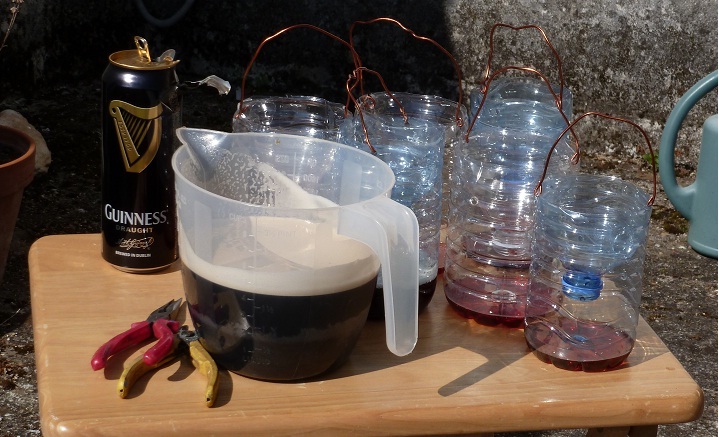 About the hornet trap I modified the design from the original so that the beer was behind a grill and I did not trap other things. I do not use it just now as there are too many butterflies around.